I. General Practical Information. II. Metallation of Acetylenes. III. Functionalization of Metallated Acetylenes with Alkyl Halides, &agr;-Haloethers, Epoxides and Alkyl Orthoformates. IV. Ethynylation and Alkynylation of Carbonyl Compounds. V. Carboxylation, Alkylation and Related Reactions. VI. Silylation, Stannylation and Phosphorylation. VII. Sulfenylations and Related Reactions. VIII. Halogenation and Cyanation. IX. Introduction of the Triple Bond by Elimination and Addition-Elimination Reactions. X. Couplings of Acetylenes Assisted by Copper and Palladium Compounds. XI. Base-Promoted Interconversions of Acetylenes. XII. Miscellaneous Preparations of Acetylenic Derivatives. Instructions for Searching. List of Selected Compounds. Type-Compound-Method Index. References. 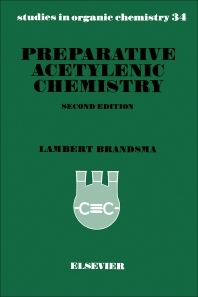 The first edition of Preparative Acetylenic Chemistry was published in 1971 as one of a series of laboratory manuals containing experimental procedures. The book was used extensively by students during practical courses and laboratory research work and enabled procedures to be carried out by persons with relatively limited bench experience. Discussions about their results have in many cases led to modified procedures or descriptions which have now been incorporated in this considerably revised and up-dated edition. The new book contains a collection of some 250 experimental procedures on a scale of at least 0.1 molar for the preparation of a wide variety of compounds with a triple bond. A number of procedures in the old edition have been omitted and replaced by others; the subdivision and titling of the chapters and experiments have been changed; and the indexes have been replaced by a type-compound-method index. Some new and attractive methods have been included, e.g. eliminations under phase-transfer conditions and couplings under the influence of zero-valent palladium compounds. In a number of cases, additional experiments have been described in order to give a more complete picture of the scope of the concerned methods. This collection is based on almost 30 years active bench experience by the author and all the procedures have been checked at least once in the author's laboratory. It will undoubtedly provide as much useful and practical assistance as did its predecessor.